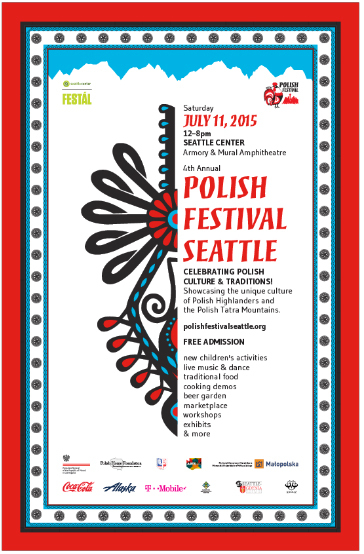 SGSCA is proud to be part of the Polish Festival Seattle on July 11th. This will be our 3rd year hosting the “Best of Poland” booth! There you will find intriguing information on Poland, free give-aways and hopefully your smiling face! We’ll have balloons, our famous red bags to hand out PLUS three framed Polish photographs to give-away at 2pm, 4pm, and 6pm. This year’s Best of Poland focuses on Zakopane and the the Tatra Mountains. Please join the Polish community for a cultural experience. Special thanks to the City of Gdynia, our sister city, for their assistance in promoting the “Best of Poland” with us. SGSCA is a Festival Partner for the 2nd Annual Polish Festival and will be hosting the “Best of Poland” booth! There you will find intriguing information on Poland, free give-aways and hopefully your smiling face! This is our opportunity to share our Polish culture, share our experiences as SGSCA members and promote SGSCA and the Seattle Polish Film Festival before a crowd of thousands. We will pass out promotional bags and we will have a “guess how many eggs” in the bowl contest as well. We are looking for a few more members to man the Best of Poland and/or Polish organization booth on Saturday, July 13. Show your support by volunteering during this wonderful festival.